I have seen many ideas similar to this but the one that really inspired me was this pin by falguni_nails. The blue really drew my attention (but don’t worry, there will be a pink version at some point too :P). I completely messed up the first try but then I changed it up a little and this is what I came up with. I started with 3 coats of China Glaze – Liquid crystal on my pinky and ring and thumb and left that to dry completely. I then used 2 coats of Sinful Colors – Sugar Rush on my middle and 2 coats of Sinful Colors – Endless blue on my index. I then used my chevron tape guides from Born Pretty Store on my ring finger and filled in the spaces with first Sinful Colors – Snow me white, then Sinful Colors – Sugar rush and ended with Sinful Colors – Endless blue on the tip. I pulled off the guides as soon as I could while the polish was still wet. Topcoated everything and good to go. I realise I also haven’t show you liquid crystal before so here it is. This looks so much nicer in real life than it does on any photo. It is super sparkly. This is 3 coats with no topcoat. Dries with a slight texture (because of the glitter) but with topcoat it is beautifully smooth (and sparkly). It is mostly blue but has pieces of multi coloured glitter in there as well. Sooo beautiful. Thanks so much Kerry. Liquid crystal is soooooo stunning! Thank you! Those blues are gorgeous aren’t they? 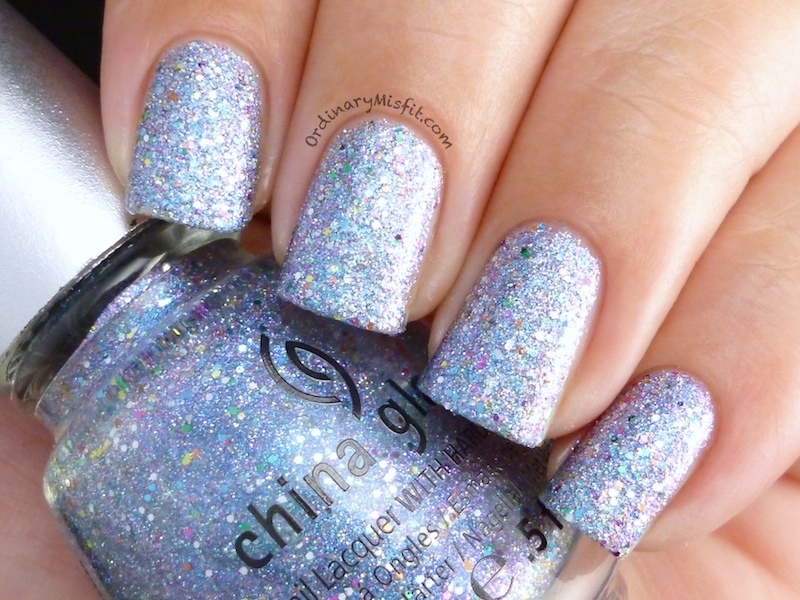 this glitter is seriously amazing! why have i never seen it before! I agree! And I have also not seen it around all that much. Very underrated if you ask me! Damn you. Now I need liquid crystal. Love that ring finger nail…brilliant!